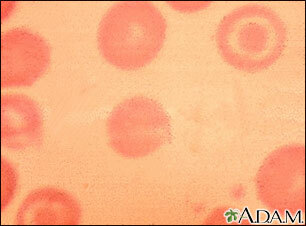 A blood smear is a blood test that gives information about the number and shape of blood cells. 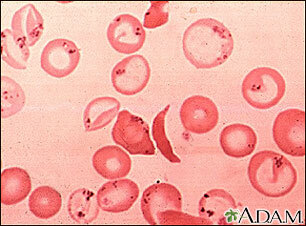 It is often done as part of or along with a complete blood count (CBC). 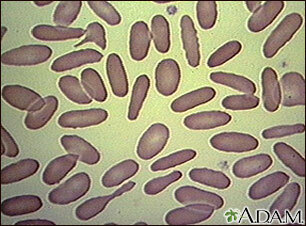 The blood sample is sent to a lab. 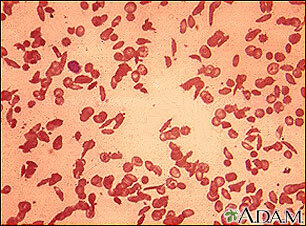 There, the lab technician looks at it under a microscope. 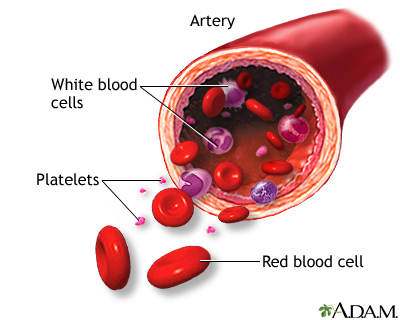 Or, the blood may be examined by an automated machine. 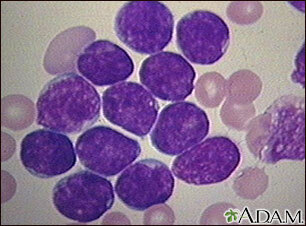 A blood smear may also be done to monitor the side effects of chemotherapy. 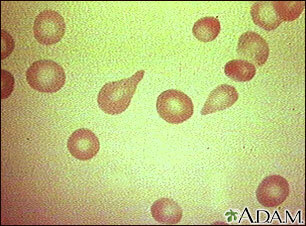 Abnormal results mean the size, shape, color, or coating of the red blood cells (RBCs) is not normal. 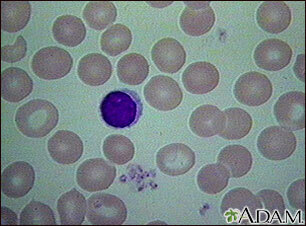 Presence of RBCs with an oval shape may be a sign of hereditary elliptocytosis or hereditary ovalocytosis. 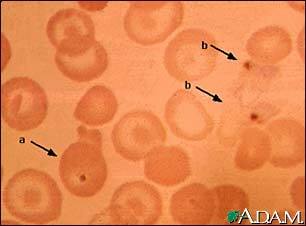 These are conditions in which RBCs are abnormally shaped. 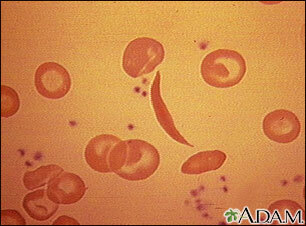 The presence of sickle cells may indicate sickle cell anemia. Bain BJ. 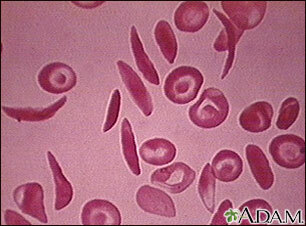 The peripheral blood smear. In: Goldman L, Schafer AI, eds. Goldman's Cecil Medicine. 25th ed. Philadelphia, PA: Elsevier; 2016:chap 157. 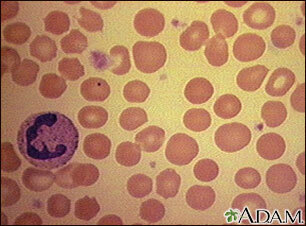 Natelson EA, Chughtai-Harvey I, Rabbi S. Hematology. In: Rakel RE, Rakel DP, eds. 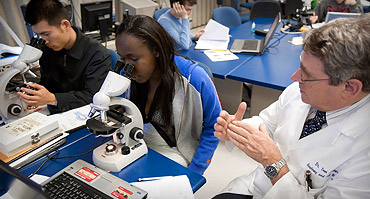 Textbook of Family Medicine. 9th ed. Philadelphia, PA: Elsevier; 2016:chap 39. Warner EA, Herold AH. 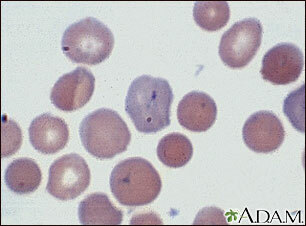 Interpreting laboratory tests. In: Rakel RE, Rakel DP, eds. Textbook of Family Medicine. 9th ed. Philadelphia, PA: Elsevier; 2016:chap 14. 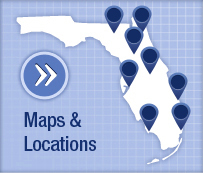 Todd Gersten, MD, Hematology/Oncology, Florida Cancer Specialists & Research Institute, Wellington, FL. Review provided by VeriMed Healthcare Network. 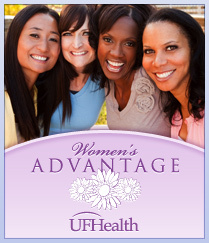 Also reviewed by David Zieve, MD, MHA, Isla Ogilvie, PhD, and the A.D.A.M. Editorial team.